Despite the gorgeous weather outside (truly, this has been the most spectacular July in recent memory here in Vancouver), I am on deadline for my August photo essay submission for Sport Diver Magazine. So, here I am, numb butted, culling through reams of images that I have shot in Cozumel over the years – I’ve been diving there at least ten times, and shot a camera on at least six of those trips, so there is a rather daunting number of images to choose from. Patricia, the lovely editor of Sport Diver, graciously allows me to decide what destination to feature, and how to best represent it with images and words. We’ve agreed that I’ll do a couple of pieces on Cozumel – the first will be all about the ‘Big Picture’ – that is, wide angles of the epic terrain and schooling fishies, and then sometime in the near future I’ll do another photo essay on ‘Coz Critters’, including some wee macro subjects. 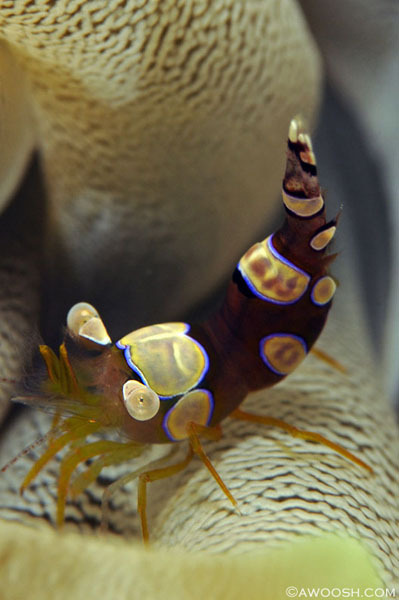 This may be my fave macro shot that I’ve taken in Coz – a Squat Anemone Shrimp (Thor amboinensis). These little critters (about 1/2 an inch in length) are not uncommon – if you closely check out any of the several varieties of anemones in the Caribbean, you will probably find at least one of these, and/or possibly some of the other common, pretty shrimps (Pederson’s, Spotted Cleaner etc). But these little shrimp are not so easy to photograph – they tend to retreat into the tentacles of the anemones, and they seem to be in constant motion, like you will be as a diver, and like the anemone’s tentacles will be too, because Cozumel very often has quite a bit of current blowing through its best sites. So I was altogether pretty pleased when I bagged this one. If you would like to read more about staying and diving on Cozumel, I produced a very detailed primer/trip report last year. I really hope it is helpful to folks thinking of going, but not knowing where to start. You’ll find the whole enchilada here. This entry was posted in All About Scuba Diving, Mexico Travel, Pic of the Day and tagged cozumel, Squat Anemone Shrimp, Thor amboinensis. Bookmark the permalink. really nice blog and nicely written/photographed articles and essays! impressed. how do you have time for all of the diving?? ?